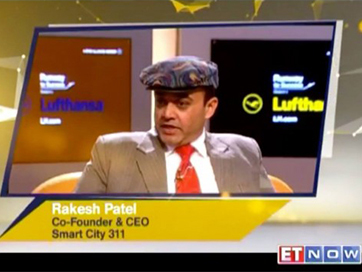 Mr. Rakesh Patel, CEO of the Space-O Technologies & Civic Solutions Pvt. Ltd. got starred in the most popular T.V show, Runway to Success (Season 3). The show was aired on 4th July 2015 on ET Now at 6:30 PM. Runway to Success is an extraordinary reality programme, which is known for celebrating the spirit of Indian entrepreneurship and showcases Lufthansa’s commitment to partnering the success of Indian business. There was a competition between Mr. Rakesh Patel, Mr. Vaibhav Dayal, founder, and CEO of Prim Resorts and Mr. Rohit Khetrapal, Co-founder of Find My Stay. The business icon of the episode was Capgemini India CEO Aruna Jayanthi. It was an extremely big landmark in our company’s runway to success.